What treatment options do you have for a patient with sensorineural hearing loss and chronic otitis externa? What about a case of mixed and/or conductive hearing loss? If your patient can’t wear a hearing aid due to medical conditions, or has mixed hearing loss, our VIBRANT SOUNDBRIDGE Middle Ear Implant can be a very useful solution. SOUNDBRIDGE is an active middle ear implant that uses minuscule vibrations to provide excellent amplification with a natural sound quality. SOUNDBRIDGE uses a floating mass transducer (FMT) to turn electrical signals from the audio processor into mechanical sound vibrations. This FMT connects directly to structures in the middle ear, allowing you to bypass the outer ear and missing or damaged ossicles. The VIBRANT SOUNDBRIDGE system has been an effective solution for more than 20 years, but we’re always striving to provide the best possible systems available. Four years ago, we launched the latest generation of the SOUNDBRIDGE implant: the VORP 503. The VORP 503 implant was developed in close collaboration with surgeons who had worked with the previous generation (VORP 502) implant and had experienced its strengths and identified challenges. After 4 years on the market, it’s time to evaluate the latest generation of SOUNDBRIDGE implant. Let’s look at the clinical data and see if the VORP 503 implant has made the grade. 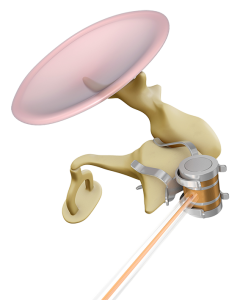 The floating mass transducer is connected to the structures of the middle ear using one of several specially designed Vibroplasty Couplers. With the VORP 503, a new Vibroplasty Coupler was developed which allowed for the FMT to be fixed to the short process of the incus. The Incus-SP-Coupler attaches the FMT to the body and short process of the incus. This new Incus-SP-Coupler is unique, because it lets you attach the FMT without needing to drill a posterior tympanotomy. It can be placed through a posterior epitympanotomy, away from the facial nerve and chorda tympani. The new coupler has certainly been well-received; analysis shows that it is used in more than 30% of all VIBRANT SOUNDBRIDGE implantations (as of January 2018). Why do so many surgeons prefer this coupler? The Incus-SP-Coupler was clearly a useful innovation in the VORP 503, but the improvements don’t stop there. What other features deserve a closer look? Many surgeons asked us to shorten the conductor link between the implant body and the FMT, because a shorter conduct link makes it easier to handle the device during implantation. This is why we shortened the conductor link for the VORP 503, and we also increased the tensile strength of the conductor link. By doing this we not only made handling easier, but we also reduced the risk of conductor link breakages. While the VORP 502 was very reliable, issues with the conductor link occurred in 1.72% of all cases. With the reinforced conductor link of the VORP 503, we have reduced this down to an outstandingly low 0.04%. The VORP 503 is fixed to the bone with 2 self-drilling cortical screws. This way of fixing the implant and immobilizing it reduces any chance of movement, which could potentially lead to fatigue fractures of the conductor link. With the VORP 503 and fixation with screws, the rate of fatigue fractures went down to an incredible 0.00%. Considering that the implant will stay with the user for the rest of their lives, the reliability aspect is crucial. At MED-EL, we are always striving to increase reliability for the best possible long-term outcomes for patients and professionals. We’re happy to report that the 42-month data shows that implant failures without external impact went down from 1.42% (VORP 502) to 0.26% with the VORP 503. The survival rate (excluding impact issues) of the VORP 502 was already outstanding (98.58% at 42 months), but the VORP 503 survival rate (excluding external impact) is now 99.74% at 42 months. Even this small difference can mean significantly better outcomes and greater peace of mind for your patients. And last but not least, VORP 503 is approved for 1.5 Tesla MRI scans—ensuring that your patients can have safe, comfortable access to essential medical imaging. VORP 503 uses a secure, force-balanced magnet not only in the coil but also in the tiny FMT that enables comfortable 1.5 Tesla MRIs. Thanks to this unique magnet technology, the latest generation of SOUNDBRIDGE is designed to avoid any torque-related movement in an MRI, so no head bandage is needed. The outcomes for recipients with the previous generation of SOUNDBRIDGE was already very good. But we are always working to go beyond—to provide the best experience for every surgeon and the possible outcomes for each patient—because we care. By working closely with our professional partners, we’ve been able to make VORP 503 an implant that’s truly designed to deliver superior performance for both patients and professionals. Ready to learn more about implanting VORP 503? Check out this HD video case study to see step-by-step guidance for implanting the VORP 503. Have a question about VIBRANT SOUNDBRIDGE? Use our simple contact form! Make sure you get all the latest MED-EL Professionals Blog articles right to your inbox—subscribe now! *Not all products, indications, and features shown are available in all areas. Please contact your local MED-EL representative for more information.